"These are the best pork chops. My family just loves them. The best part is, the marinade only has 2 ingredients. They are great from the skillet, oven, or off the grill. I like to make these with extra-virgin olive oil, but not needed." Mix teriyaki sauce and molasses in a bowl until well combined and place pork chops in the mixture; turn chops to coat with marinade. Allow to stand at least 30 minutes (longer for better flavor). Spray a skillet with cooking spray and place over medium heat. Cook the pork chops until the juices run clear and the chops are browned and no longer pink inside, about 10 minutes per side. An instant-read meat thermometer inserted into the thickest part of a chop should read 160 degrees F (70 degrees C). If you are going to prepare them in the oven, grease a casserole dish and bake at 350 degrees for 20-25 minutes. I tried baking as suggested -- I did not care for this recipe. 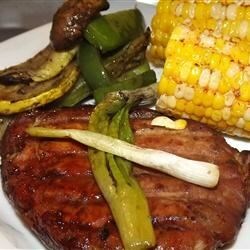 My husband said these were the best pork chops I've ever made! I marinated for 4 hours and cooked on a grill pan, 10 mins per side was perfect. Thanks for a keeper! This couldn't be any easier to make! I marinated for a few hours in the fridge before cooking. Yummy!